I have solved a great mystery-one that has stumped mothers for eons. I know, who would have thought that I, a normal housewife from California, would have solved one of the greatest mysteries of all time? Um, OK. Maybe it’s not the greatest mystery. I mean, I haven’t found Jimmy Hoffa living next door. But I did solve a pretty darn good mystery. I know where all the socks on the planet are hiding. OK, maybe I just know where all the socks my family has lost are hiding. But still. It’s a mystery and I solved it. I know the precise location of every lost Sontag sock. They are all under my bed. Or at least they were under my bed. Oh, I know you are wondering how they got there. Or perhaps you’ve read this column once or twice and you are nodding knowingly to yourself and thinking, “No-no Lulu.” And you would be right. 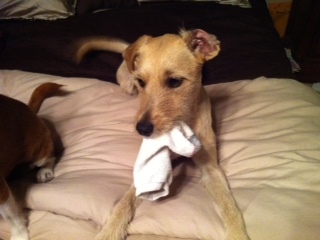 No-no Lulu is apparently a notorious sock thief. And she’s been stealing since was a puppy. 1) not leaving the remote cabin after your friends have all been murdered by a vengeful slasher. 2) looking under the bed just before the slasher grabs your ankle and drags you under there with him/her/it and your freshly dead best friend. So obviously, I don’t visit remote cabins and I don’t look under beds. And that is what made that a perfect hiding place for No-no Lulu to keep her secret sock stash. But the other day, I allowed the robot vacuum to clean under there, because honestly? We’ve lived here three years. It was probably time to kick out the dust bunnies and slashers. Imagine my surprise when the darn iRobot starts beeping at me, indicating that he/she/it had found something under the bed and gotten stuck. Holy cow. Visions of slashers ran through my head. Not pleasant, let me tell you. So I did what any easily frightened mother would do. I made my teenage son look under the bed, Hey, don’t go there. I know what you’re thinking and it’s not true. I’m a good parent. I held him by the waist so I could quickly pull him back if a slasher tried to grab him. Anyway, it turns out that the vacuum was stuck because it had tried to eat approximately 4,381 socks, not one of which had a matching sock living under the bed with it. And apparently, they belonged to No-no Lulu. I know this because the minute we started pulling socks out from under the bed, No-no Lulu started whining and trying to get them away from us. Clearly these were her sock babies and she wasn’t going to allow us to touch them. I can’t tell you how much fun it isn’t to be halfway under a bed, surrounded by three years worth of dust bunnies, 4,381 smelly socks, a still beeping vacuum cleaner and then having a dog try to steal socks from you. Of course, Kirby tried to join in, but she left pretty quickly. Once she discovered we weren’t hiding sacks of treats under there, it wasn’t worth her time. She went back to her usual chore of barking her brains out at trees that had the audacity to disturb her by blowing in a slight breeze. After a few minutes of yelling, “No-no Lulu,” which not surprisingly does absolutely no good since that’s what we call her all the time, I finally captured the squirming dog, set a few socks she had in her mouth free and put her outside. 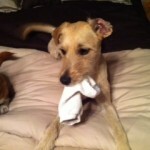 Then I wriggled under the bed and liberated the rest of the socks. And when No-no Lulu returned, she immediately went under the bed only to find it empty of socks, dust bunnies, and slashers. Poor No-no Lulu looked like she had lost her best friends. I actually felt sorry for her. Until I washed 4,381 lost socks, and discovered that many of them didn’t belong to us. So if you live near me and you are missing some socks, drop by. Unless you are a slasher. Your socks are probably in a remote cabin somewhere. My dog No-No Down loves to steal my kitchen untensils. Wooden spoons, measuring spoons, spatulas, ladles, measuring cups…the list goes on and on. I feel your pain! My basement, which is No-No Down’s holding zone for all theived items, resembles the Beaches of Normandy with my wounded untensils left for dead. Tragic, really.